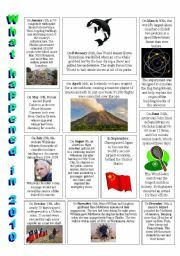 This reading activity provides a summary of news stories in 2010. In simple language each section highlights a story that hit the news, month by month in 2010. 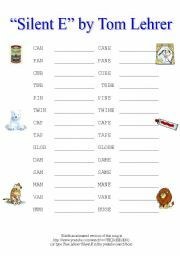 This simple activity allows students to express seven new year resolutions using a different sentence starter for each one. I find it is a good opportunity to review class rules and personal study aspirations! Happy New Year! 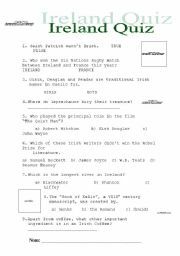 A quiz about Ireland for Saint Patrick´s day. To celebrate Saint Patrick´s Day here is a little quiz about Ireland covering many aspects of Irish culture, history, sport, language and landmarks. It is fully editable and includes a key. This sheet is a visual aid that can be used to learn the colours of the rainbow. 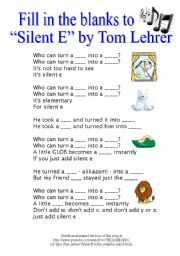 Activity based on the humourous "Silent E" song by Tom Lehrer. YouTube link provided. Part 1 of 2. 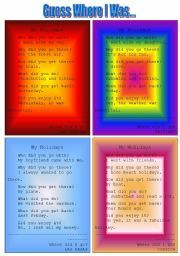 A listening activity based on a funny song from the very funny Tom Lehrer. 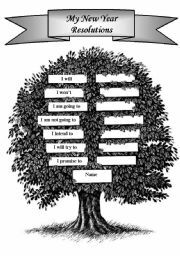 Students must try to fill in the blanks while listening to the song. I have provided the youtube link and a full version of the song on Page 2. 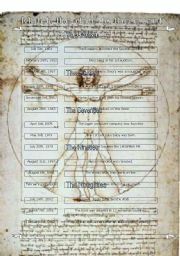 Trivia dates game to practice past simple and dates (with key). 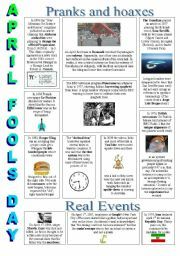 This is a simple activity which involves matching the appropriate date to the event in history. I created it to encourage practice in speaking dates and using the past simple. It really gets conversation going when used with adults.